The Sanskrit word dharma refers to the inherent, unchanging nature of something; sugar's dharma is to be sweet, water's dharma is to be wet, and fire's dharma is to emit heat and light. Dharma also means our natural duty; beavers build dams, spiders build webs, and dogs bark. As humans, we have social, familial, religious, and civic duties. But our ultimate human dharma is to find life's ultimate answers; who we are, why we're here, and what we're supposed to do. 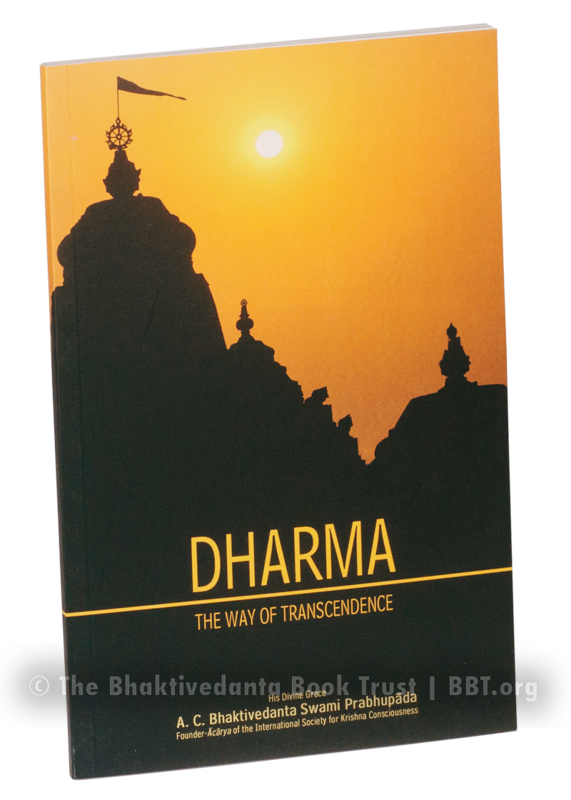 Dharma, the Way of Transcendence is a compilation of lectures on human dharma that His Divine Grace A.C. Bhaktivedanta Swami Prabhupada gave during his 1972 tour of India. He says that every living being's dharma is service; no one can exist for a moment without serving someone or something else, even if it's only our mind and senses. The question is, whom or what can we serve if we want the greatest return on our investment of energy?.